Welcome to our Rebates and Specials Headquarters. 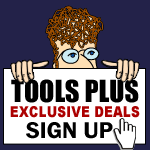 Below you will find the latest promotions from the industries top manufacturers, along with EXCLUSIVE Tools Plus deals that you won't find anywhere else. We know that everyone loves a great deal, so we make it our business to hunt down every special we can find and pass it on to you right away. Consider this your "One Stop Shop" for savings and check back regularly. 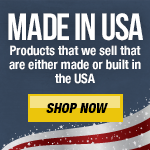 Specials are grouped by manufacturer, so scroll down to see the full list! Mail-in Rebates come to you as a form that should be included with your shipment. In the event we mess up and forget to send it, don't panic. Either email us or call us here at 1-800-222-6133 with your information and your request, or go to that manufacturers web site and you can usually print a copy from them. Note for International Customers: Most mail-in rebate offers are valid for US residents only. Please check the rebate details and forms closely before ordering. Instant Rebates are rebates that are deducted at time of purchase. The price that appears in your shopping cart reflects the instant rebate. Improved decompression valve and metering spring for precise fuel regulation at start up.